Bryce Canyon National Park is located in south-western Utah. This national park covers an area of 145 square kilometers. 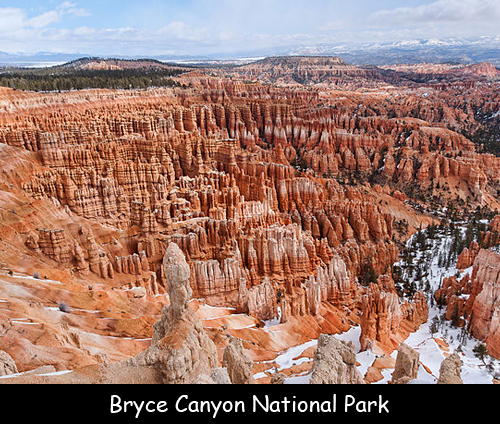 Its main feature is Bryce Canyon (after which it has been). Technically this is not a canyon as it was not formed from erosion. It was initiated from a central steam. It is famous for its unique geology. The red, orange and white colored rock formations are known as the hoodoos. The rock layer which forms hoodoos is known as the Claron formation. More than one million people visit the Bryce Canyon National Park every year. The highest part of this national park is Rainbow Point measuring 2,775 meters and the lowest part is Yellow Creek measuring 2,020 meters. There is a series of amphitheatres extending more than 30 kilometers and the largest of these is Bryce Amphitheatre. The rim at the Bryce Canyon ranges from 2,400 to 2,700 meters. On the basis of elevation, the park has three different life zones which are Spruce Forest, Ponderosa Pine Forest and Pinyon Pine Forest. There are a total of 175 different bird species that have been documented as frequents to the park. Over 400 native plant species can be found here. The rocks in the park are approximately 65 million years old but they are still believed to be the youngest on the Colorado Plateau. The canyon became a national monument in 1923 and officially made a National Park in 1928. It was named in 1875 after a Mormon pioneer man named Ebenezer Bryce. He started ranching in the area. Wildlife such as Black Bears, Coyotes, Bobcats and Mountain Lions, Badgers and Eagles.